The ovoid jar has a broad splayed foot, a short wide neck, accentuated with two ribs, and two pairs of small lugs attached at shoulder and neck. The body shows horizontal grooves from turning. The piece is fully glazed, leaving only the underside of the foot free, the biscuit is of buff colour. 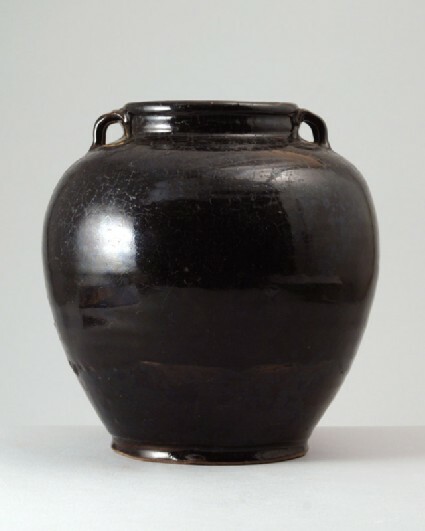 The black glaze has overall crazing, which has later been treated to make it more apparent. One lug and a chip at the rim have gilt repairs.